From left to right, Eric Macias, Diana Felipe, Yadilsa Diaz and Carla Betancourt, four of the Rutgers students who won scholarships. 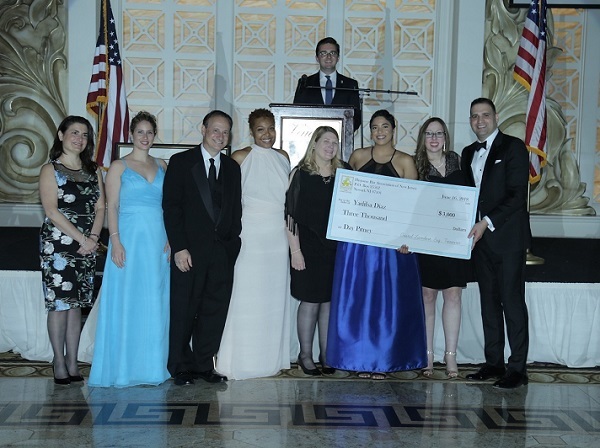 The Hispanic Bar Association of New Jersey has awarded scholarships to nine Rutgers Law students at its gala in June. 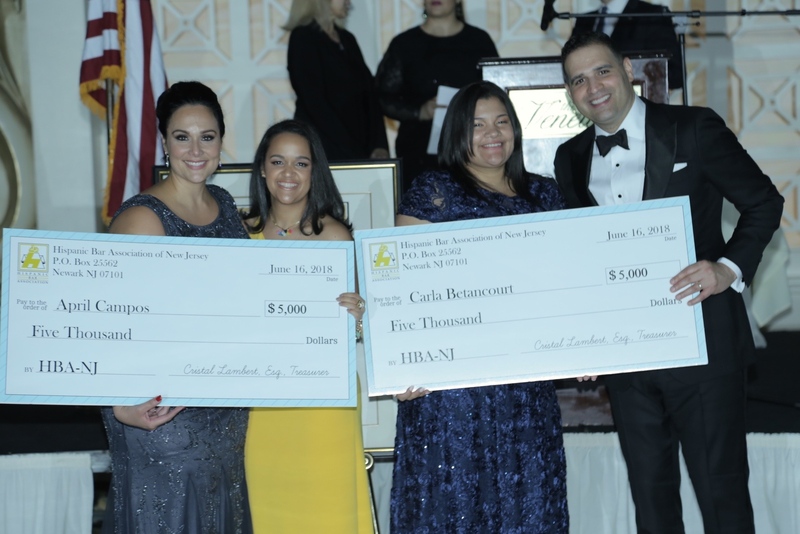 Carla Betancourt won the Hispanic Bar Association of New Jersey and attends law school in Newark. Betancourt was born in the Dominican Republic and came to the United States when she was eight. She earned her bachelor’s degree from Carnegie Mellon University and worked for 10 years helping low-income families from getting evicted. She has interned at the Passaic County Prosecutor’s Office and was a judicial extern for Judge Esther Salas. She is clerking at Adams Gutierrez & Lattiboudere LLC and will also be the Senior Notes and Comments Editor at the Women’s Rights Law Reporter when she comes back to Rutgers Law for her final year. Carla Betancourt is pictured on the right receiving her scholarship. 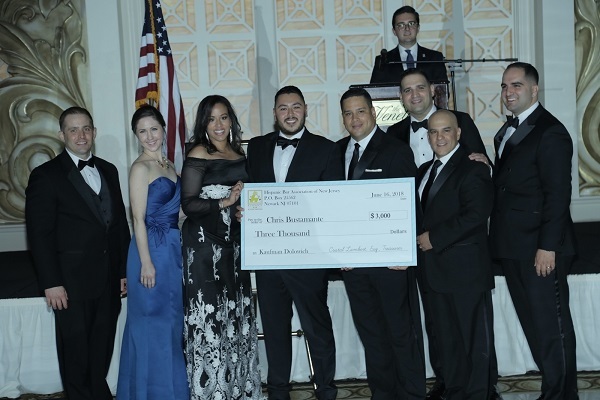 Chris Bustamante won the Kaufman Dolowich Voluck Scholarship and attended law school in Camden. Bustamante worked in the Domestic Violence Clinic and served as Vice President of the Rutgers Women’s Law Caucus. He volunteered as an interpreter and translator for Rutgers law clinics and for DACA registration events and is active in fighting for LGBTQ rights, including having an externship with the Mazzoni Center in Philadelphia and working with a non-profit rights organization in Chile. He has interned at the state Attorney General’s Office and won awards at graduation for his service. He will begin a clerkship in Hudson County in August. Chris Bustamante is pictured above receiving his scholarship. Yadilsa Diaz won the Day Pitney LLP Scholarship and attends law school in Newark. Diaz belongs to the Association of Latin American Law Students and the Association of Black Law Students. She volunteers as a mentor with the Hispanic Bar Association of New Jersey’s American Dream Pipeline Program and has traveled to Thailand and Cambodia volunteering with non-profit organizations. 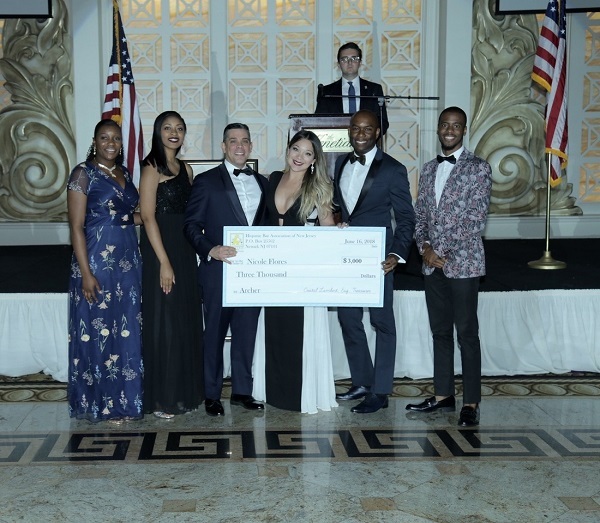 She will be the Vice President of Academic Affairs for the Association of Latin American La Students this fall and is spending her summer as an intern at Prudential Financial Inc.
Yadilsa Diaz was another of the night's scholarship winners. 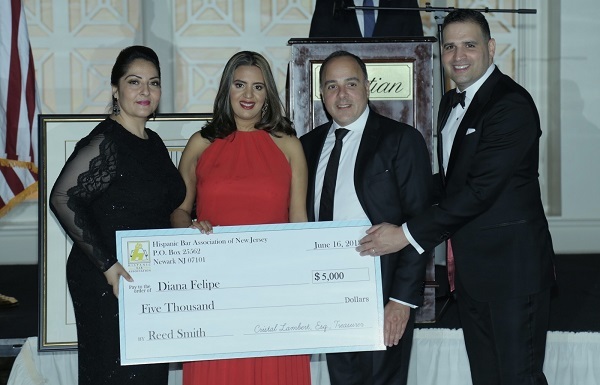 Diana Felipe won the Reed Smith Scholarship and attends law school in Newark. Felipe, who immigrated from the Dominican Republic when she was six, worked as a paralegal before attending law school. She is working at Goldman Sachs this summer. She also volunteers with CUNY Citizenship now, assisting with naturalizations and she mentors students at Passaic High School. Diana Felipe was one of the evening's scholarship honorees. Nicole Flores won the Archer Scholarship and attends law school in Newark. Flores is a graduate of Hofstra University and formerly worked as a real estate law clerk in Miami. She has worked as a summer associate at Proskauer Rose L.L.P. and this summer is an associate at Debevoise & Plimpton LLP. She also was the Vice President of Academic Affairs for the Association of Latin American Law Students and was a part of the Hispanic Bar Association of new Jersey’s Disaster Relief Committee for Puerto Rico. Nicole Flores is pictured above with her scholarship award. 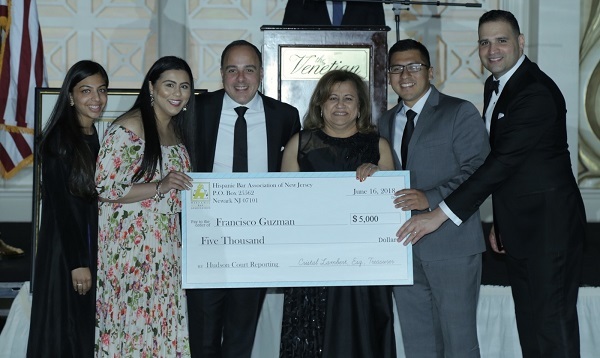 Francisco Guzman won the Hudson Court Reporting Scholarship and attended law school in Camden. Guzman graduated in May from Rutgers Law with honors and was recognized for his public service work with an award at graduation. He formerly worked as a law clerk for the City of Philadelphia and was a summer intern with the Atlantic County Prosecutor’s Office. He also was an extern with the New Jersey Senate. In law school, he contributed to Law Review and was a member of the Hunter Moot Court, in addition to being active in pro bono projects and working with the Immigrant Justice Clinic. Francisco Guzman was one of the night's scholarship recipients. 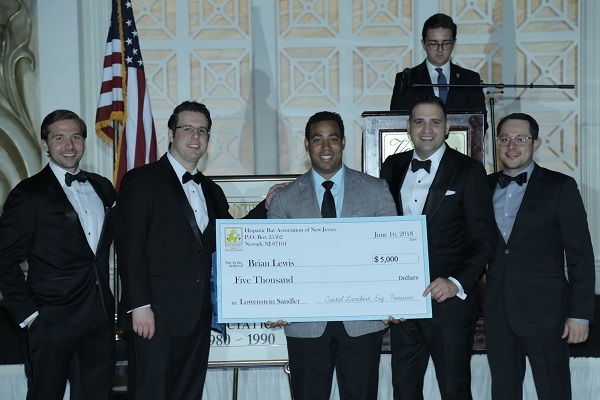 Brian Lewis won the Lowenstein Sandler Scholarship and attends law school in Camden. Lewis is the first in his family to attend college. After graduating from Columbia University, he worked as a paralegal in Washington D.C. before attending law school. He is spending this summer as an intern at GlaxoSmithKline and will be the President of the Intellectual Property Association this fall. Brian Lewis, another scholarship winner, hopes to practice Intellectual Property law in the future. 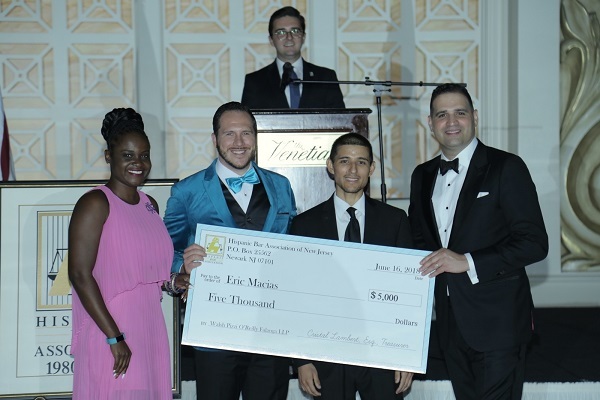 Eric Macias won the Walsh Pizzi O’Reilla Falanga Scholarship and attended law school in Camden. Macias graduated from law school in May where he was on the Dean’s List for four years and received several pro bono awards at graduation. He has volunteered for Legal Services of New Jersey, the Hebrew Immigrant Aid Society and also worked at the Immigrant Justice Clinic. He also received the Maida Public Interest Fellowship at Community Legal Services and the Deborah T. Poritz Fellowship at South Jersey Legal Services. He will be work as a clerk with Judge Francisco Dominguez. Eric Macias graduated from Rutgers Law in May. 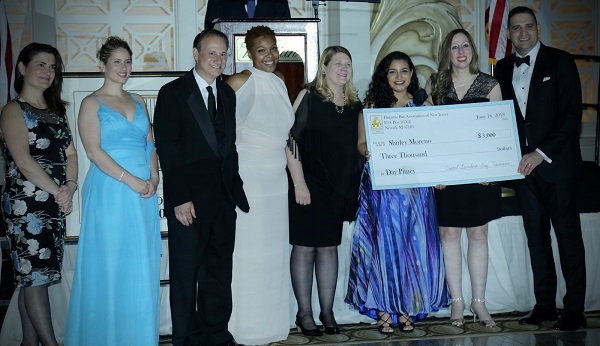 Shirley Moreno won the Day Pitney LLP Scholarship and attends law school in Newark. Moreno graduated from The College of New Jersey and recently finished her first year at Rutgers Law School, where she was a representative for the Association of Black Law Students and the Association of Latin American Law Students. She is a mentor for the Hispanic Bar Association of New Jersey’s American Dream Pipeline program and also mentors students from her high school in Long Branch.